The Bodleian Library in Oxford announced earlier this week its acquisition of a rare, fifteenth-century French Gothic coffer, or book chest, once used for the transportation of books. According to the Bodleian, only about 100 such book coffers are extant, and this is the first of its kind to enter the library’s collection. It is also the centerpiece of a new exhibit at the Bodleian’s Weston Library called Thinking Inside the Box: Carrying Books Across Cultures. What the coffer held is unknown, although, according to experts, it is believed to have secured religious or devotional texts, perhaps with accompanying relics, such as a rosary. The exhibition, which features a selection of boxes, bags, and satchels designed to carry books, remains on view through February 17. If you can’t make it to Oxford, a 3D model and photos of the coffer can be seen on the University of Oxford’s Cabinet website. The Bodleian Library in Oxford announced earlier this week its acquisition of a rare, fifteenth-century French Gothic coffer, or book chest, once used for the transportation of books. According to the Bodleian, only about 100 such book coffers are extant, and this is the first of its kind to enter the library's collection. It is also the centerpiece of a new exhibit at the Bodleian's Weston Library called Thinking Inside the Box: Carrying Books Across Cultures. The book chest is made of wood, covered in leather, lined with red canvas, and reinforced with iron fittings, hinges, and a lock. 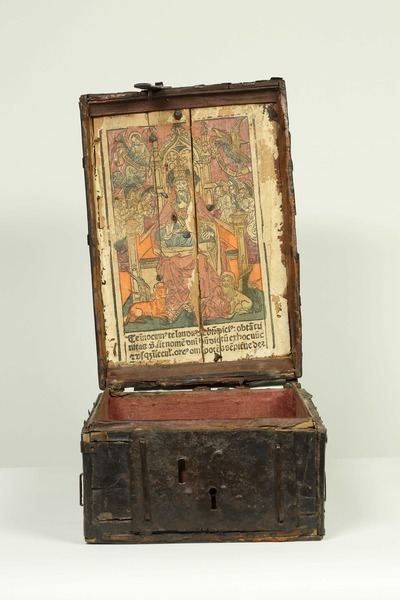 As you can see in the above image, the coffer's inside lid contains a colorful woodcut print dating to c.1491 depicting "God the Father in Majesty." The exhibition, which features a selection of boxes, bags, and satchels designed to carry books, remains on view through February 17. If you can't make it to Oxford, a 3D model and photos of the coffer can be seen on the University of Oxford's Cabinet website.